Happy almost-end-of-January. I did that thing again where I jotted down mini-topics on my Notes app on my iPhone for purposes of a blog post. I have a Macbook Air. And since I’m on iCloud, whenever I send myself reminders on my iPhone, whenever I open up the laptop, there’s a pop-up there too, with the reminder I saved on my phone. Just now when I opened it up, it told me, “GET TP!! !” Thanks, laptop. We’re all good now though! I haven’t logged in here for a few weeks. I checked my Stats page, 0 views today. Sometimes, I’ll have 1 or 2 views, even on days when I haven’t posted in a long time. You know whose those views those are? My daughter’s. She checks here. She says she likes it, but that I use the D-word too much. Then don’t read the damned blog, kid! Just kidding. I love you. But I get to use the D-word because I’m a grown-up. You don’t. I’m not really a grown-up. I’m old, but I’m not a grown-up. My one friend, Kerry, once sent me a New Yorker piece on how the grown-up has gone the way of the dodo. And I was just catching up with my PVR and saw Billy Connolly on Strombo who was saying the same thing. He says he doesn’t care about growing up, that it’s usually someone else’s suggestion. “You have to grow up!” George asked him how he responds to that. Billy: “Two words.” I often wait for that magical moment when I’m grown up. And often ponder things that way, like, “When I’m grown up,” this, or “When I’m grown up,” that. The possibilities are endless, and I’m really looking forward to it. Sidebar: Not having hockey meant I watched other stuff on TV, and had the time to. Usually my PVR gets full of shows I’ll never watch on account of hockey. I love New Girl, Happy Endings, and Nashville. Like, love/love. Who knew there were shows on TV from October to April? I don’t watch reality TV though. But I do love talk shows. I love how the hosts always sit to the right of the screen, because if I were a guest on a talk show, they would get my right profile which is 2000% better than my left. If I hosted my own show, I’d have them switch the set around. These are things I think about sometimes. I just chose the categories for this blog post. Bold move, since I haven’t even really started it yet. One of the categories I have there is “Other Sports.” That’s ridiculous. What other sports are there? None that are written about here. Wait, I blogged a couple of times about the World Cup when Chile was playing. So that’s why. I switched the format around on this blog and lost all my widgets. Why do I ever try things. I haven’t even started my topics list yet. I win for seriously being able to write about nothing. Okay, here we go. The Habs played their first game of the “season” last Saturday. As you know, faithful readers…reader (dear Daughter), I was very much angry with the NHL and the players for putting us through 3 months of unnecessary pain by not playing hockey. I still tuned in but wasn’t excited. I still tuned in, but didn’t care. Actually, when they started training camp, the Habs announced that Scott Gomez, that black-eye of a bloated contract for a non-productive player, would not be back. He’d get paid his 5.5 million dollars to sit out the “season” and then get bought out. Sidebar: This got me to thinking, I could totally devote a blog post to what I would do if I was offered FIVE POINT FIVE MILLION DOLLARS to NOT show up to work. It’s equivalent to winning the lottery. But that would be a short, boring post. I would probably still go to the office. What else am I going to do while the kids are at school? Besides, I love the people at my office. So anyway, when Marc Bergevin announced that Gomez would not be back in a Habs jersey again, I thought, “Well played. You just got my interest again.” Look, by all accounts, Gomez is a swell guy, super well-loved by his teammates and everything like that. No one said he was a bad guy. And no one can blame the guy for signing a contract like that on the dotted line. And had he been a scorer, I might not have cared about all that money. Let’s face it: no one can actually claim they earn that kind of money. That’s ridiculous. I can’t even imagine what you actually could do to earn that money. Perhaps deserve it, which is slightly different. Sidebar: I hate Oprah. And I hate Lance Armstrong. I have never been able to stand that guy. No real reason. People thought he was some kind of hero because he won bike races, and survived cancer and then raised a bunch of money for it. But I still couldn’t stand him. Actually, here’s why: All I really knew about him is he kept dumping the women in his life. And he would dump them and immediately be in a new, serious relationship. Which meant that he was already cheating with the new one while he was still with the old one. To have a double-life like that, you have to be an accomplished liar with little conscience. So I couldn’t stand him, even when everyone around me all loved him and wore his rubber bracelet. Then all this stuff about his colossal cheating came out, and I felt validated for always hating the guy. I don’t like Oprah either. That ego astounds. And all the people who worship her, that’s crazy too. I never really thought about her one way or the other, and always watched her show, because she had great guests, and would just roll my eyes every time she’d be in what would be for her guest, a serious, intense conversation, but Oprah would always be checking herself out in the monitor. Whatever. But what got me was when once she was being interviewed for the 10th anniversary of her show, and the interviewer brought up how she was worth $6 billion dollars or whatever INSANE figure it was. And, I’m not joking, she replied, with a very straight face: “And I’ve earned every penny.” ARE YOU SERIOUS? Oh, she was as serious as a heart-attack. I never took her seriously again. So, when everyone asked if I was going to watch the Lance/Oprah show, I was like, “Lance. And Oprah? Yeah no.” The only time I ever liked Oprah was when she interviewed Stephen Colbert. And even then I didn’t really like her, I just love Colbert. I know my feeling about Opes is super unpopular. Actually, she did do one really good thing for me: It’s fun to say stuff like she does. Like when she says, “Please welcome, my friend John TRAVOLTAAAAAA!” One of my besties and I did that on a road trip. Like, “We’re going to TARGEEEEEET!” or “Let’s go to STARBUUUUUUCKS!” This was in the morning. We are both morning people. Our other bestie was super irritated. Hi, Lisa! I’m finding a way to mention you in every post. 1173 words in and I’ve strayed from my list. So anyway, I tuned in to watch the game. But it was preceded by a big, big, BIG opening ceremony. 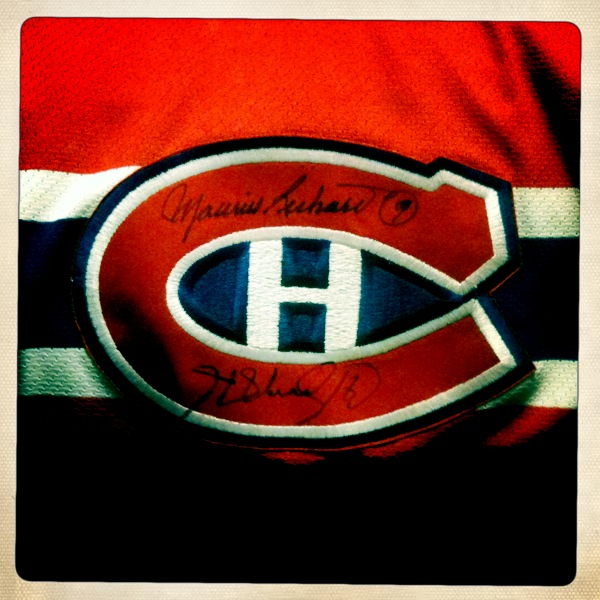 Hall of Famers carrying the torch in the Bell Centre, like Henri Richard (I met him once, and his big brother, and they signed my jersey!! ), Jean Béliveau and Yvan Cournoyer (and Vinnie Damphousse??? Um, okay.). It was an opening ceremony to end all opening ceremonies. Do the Habs ever know how to give opening ceremony. And all over Twitter, I saw tweets about how everyone was crying. And I was sitting there with my arms crossed, hmmphing. Like, wooooow, these guys were really trying hard, here. I was 100% unmoved. Had they done this when they were supposed to, in October, I would have been blubbering like a baby. But not this way, not in January, when the season is supposed to be half over. Not when, apparently, the idea was we were all supposed to act like the previous 3 months didn’t just happen. I was bitter, and I wasn’t buying it. Okay, I really loved how Carey was the last person with the torch, looking up and chewing gum. What a boss. I was excited to finally watch a game however, but didn’t even watch the whole thing because I had to leave. And they were losing to the Leafs. In a former life, during a normal season, losing, to the LEAFS, would have ruined my evening. I didn’t care, and had a really awesome evening. But then at the next game my Andrei Markov scored twice, and then at the next one scored again, and Itotallylovethemagainandcan’twaittilthenextgame. Michelle Obama got these great new bangs, right when I’ve finally grown mine out. I fail at trends. Let’s get started on that list. No, it’s too long, and I have to go pick up my daughter from a sleepover soon. I’ll keep adding to it and save it for next time.